NBC10 Boston app on your Apple TV. NBC10 Boston is now available on Apple TV. Our new Apple TV app lets you browse current news, get the most up-to-date forecast from our Early Warning Weather team and watch our top stories on your TV whenever you want. The app refreshes with new videos throughout the day, giving you access to the latest local stories, breaking news, weather and consumer investigative reporting from our award-winning journalists. 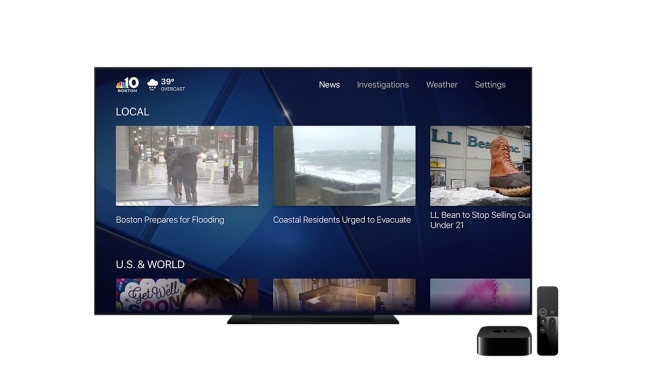 If you have a 4th generation Apple TV from 2015 or a newer device, you can download the NBC10 Boston app from the Apple TV app store and watch on demand content on your Apple TV for free. We hope you enjoy our new app. Please rate it in the app store and send us your feedback to WBTSdigitalfeedback@nbcuni.com. Your comments will help us improve the app experience.